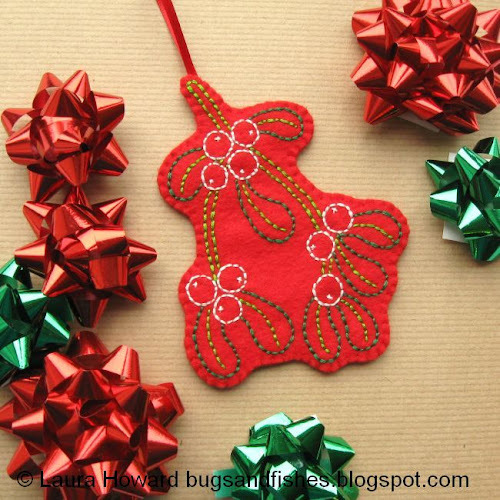 It's almost time for the Crafty Christmas tutorial link-up! Yay! So exciting. 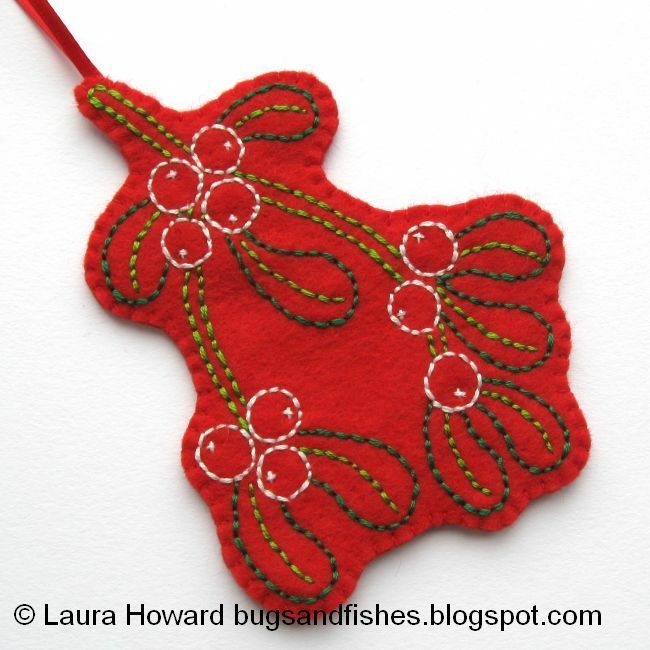 Today I'm sharing my project for the link-up - a mistletoe embroidery pattern you can use to make an embroidered Christmas ornament. I stitched my mistletoe onto red felt and turned it into an ornament for the Christmas tree, or for hanging anywhere in the house for Christmas cheer (and maybe some Christmas kisses!). You can, of course, use the embroidery pattern to add some mistletoe to anything you fancy - or maybe just frame it in a hoop. 1. 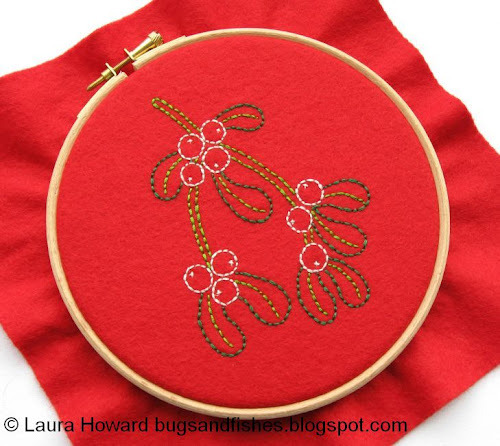 Trace the mistletoe pattern onto some tissue paper then use scissors to cut away any excess paper so the motif will fit in the middle of a 6 inch embroidery hoop. 2. Stretch a piece of red felt in the embroidery hoop. Position the tissue paper motif in the centre of the hoop, and carefully pin and then sew it in place. Use white sewing thread (or another thread that will show up against the red felt) and large tacking stitches, sewing around the outside of the misteltoe to hold the pattern in position. Remove any remaining pins. 3. Start stitching the design! 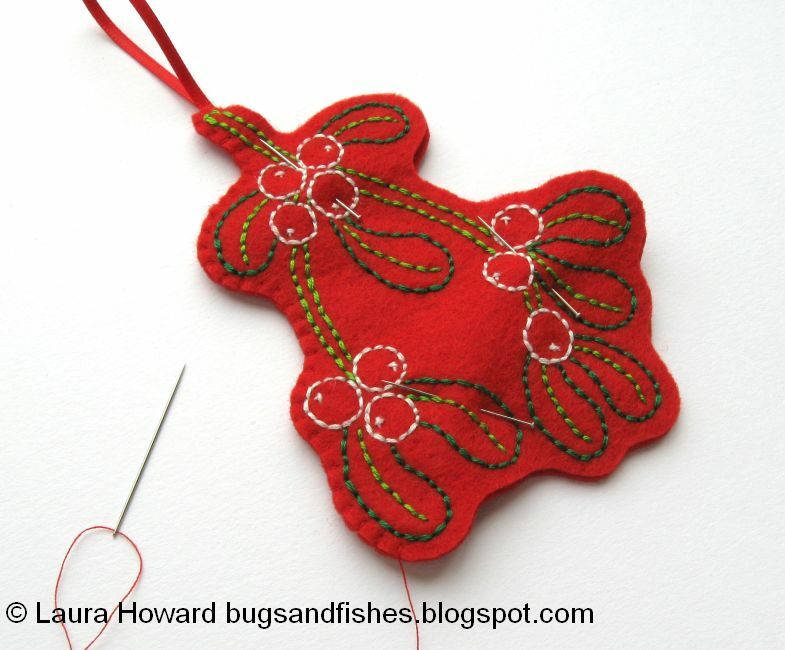 To sew my mistletoe I used half strands of embroidery thread (floss) (3 strands from 6-stranded thread) and backstitch. 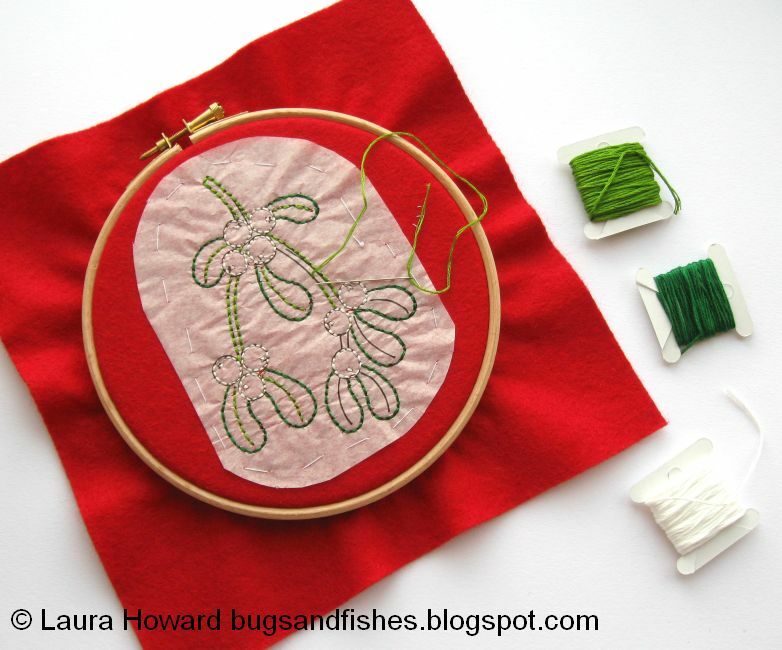 I stitched the leaves in dark green, the berries in white, and the stem and the line down the middle of each leaf in spring green. 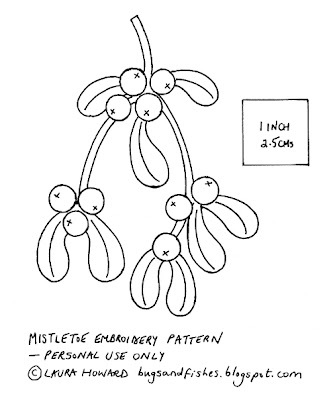 Remember you'll be cutting around the mistletoe shape later to make it into an ornament, so take care not to carry any threads where you might cut through them! 6. Use the shape you've just cut out as a template to cut a matching piece of red felt - pinning it to a piece of felt and carefully cutting round it to create a matching shape. 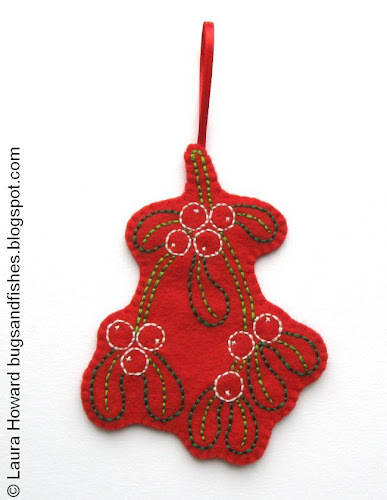 This second piece of felt will be the back of your ornament, hiding the messy side of your embroidery. 7. Cut a length of narrow red ribbon - I cut a piece 13 cm (5 inches) long, but you may want more or less ribbon depending how large a loop you want / where you want to hang the mistletoe. 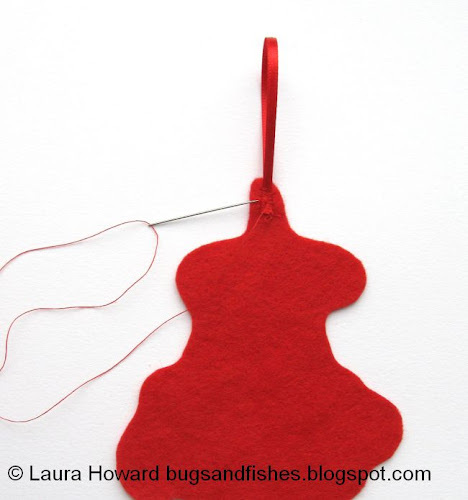 Fold the ribbon over to make a loop, and sew the ends to the top of the backing felt piece, as pictured. 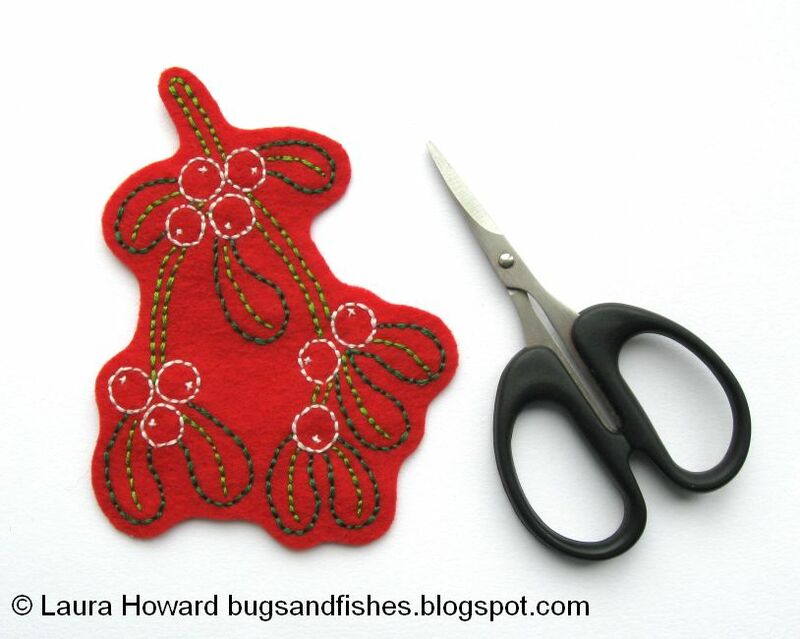 Use red sewing thread and whip stitches, and try to sew into the felt not through it. 8. 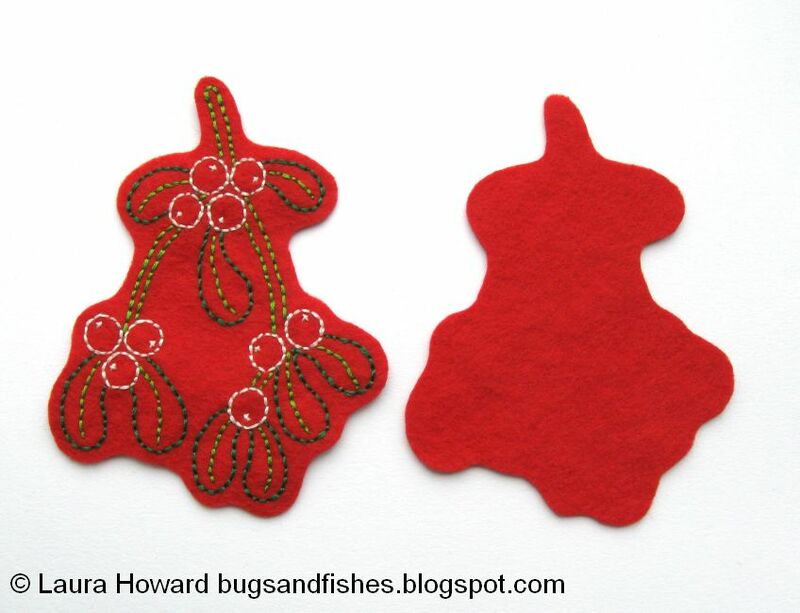 Pin the front and back pieces of your ornament together, sandwiching the ribbon ends between them. Use red sewing thread and small blanket or whip stitches to sew the edges together, removing the pins as you sew around the ornament. Finish your stitching neatly at the back. Your ornament is now finished! Hurrah! Click here to view the pattern sheet in another tab or window. Make sure you're viewing the image at full size, then print it at 100%. 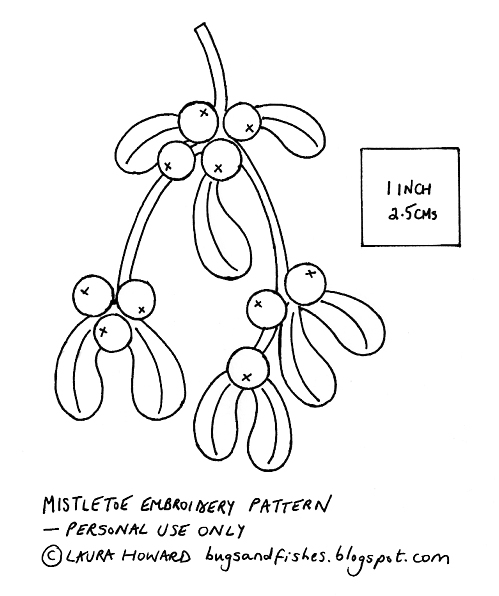 This tutorial is for non commercial use only: you can use it to make as many mistletoe ornaments (or other things embroidered with the mistletoe design) as you want for yourself or as gifts, but please don't make any for sale. You may borrow a few photos if you want to blog about this project, but remember to credit me and link back to the original source, and do not reproduce my tutorial on your site. Thanks! 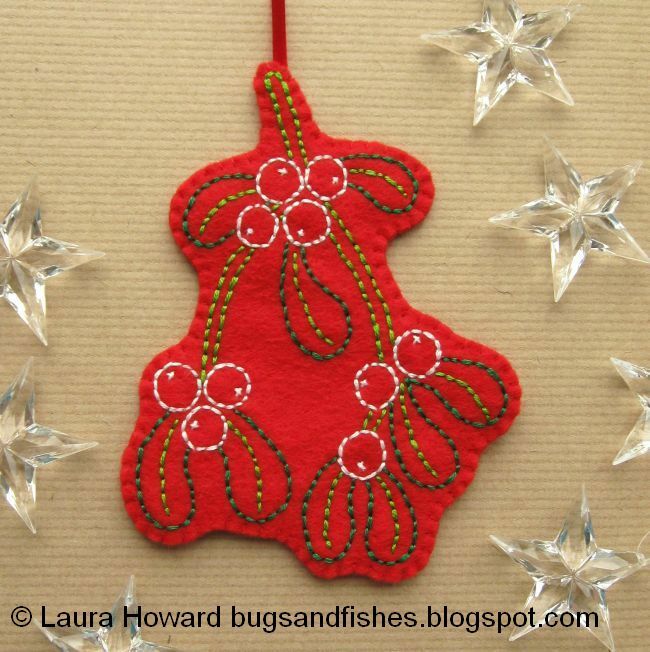 UPDATE: you can find all the tutorials in the Crafty Christmas link-up HERE. I Love this new Christmas ornament! It's soooo beautiful! I love how it looks on the hoop, too! Could be used as a hoop-ornament, it's so lovely! As per the usual Laura, your work is amaze-balls. I'll really have to try this thing of embroidery with the help of a paper template. You make it look far too lovely! A Winter Snow Globe - Free Cross Stitch Pattern! Mollie Makes: Woodland Friends - out today! Lots of Free Christmas Tutorials!